She gently grasped the branch and kissed a newly formed leaf of the horse chestnut tree in Sonoma State University's Holocaust and Genocide Memorial Grove. "It reminds me of my childhood," says Helena Foster, gently releasing the branch and breathing in the fresh summer air around the tree. "We used to play in the garden. It brings back memories of my brother, who did not make it, because they got him. I'm the only one who survived." Foster, a Holocaust survivor from Poland, was a teenager when she lost her family during World War II. A mix of emotions visibly washed over her as she touched the tree, one of 11 grown from cuttings of the tree that stood outside Anne Frank's attic window, the tree the teenager wrote about as a symbol of hope in her diary while hiding for years from Nazis in Amsterdam. Foster has a deep love of trees. She connects with their enduring life and memories they hold for individual people. She holds a special place in her heart for the Anne Frank tree in Sonoma State's Holocaust and Memorial Grove. When she touches it, the visceral memories of lives that were stolen from her come flooding back. The trip marked the first time Foster had seen the tree since the planting ceremony four years prior. She was overjoyed to see it flourishing in its new home, now robust enough to be freed of its protective fencing. "It's so beautiful I feel like crying," she said softly. 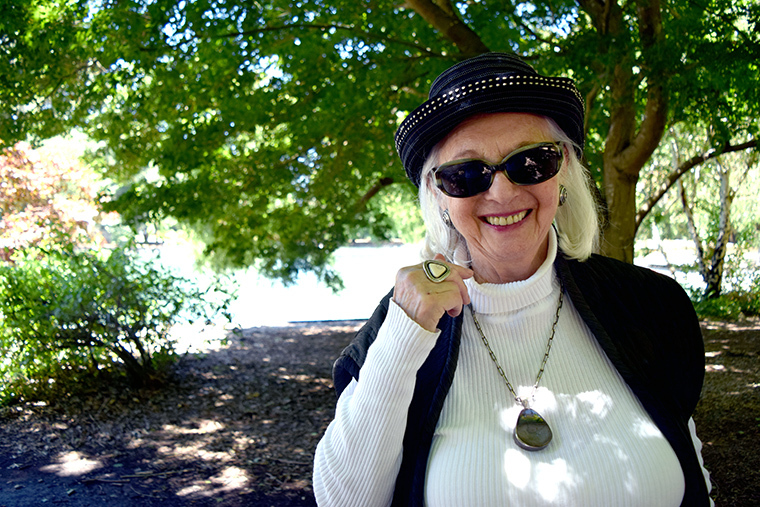 Foster returned to Sonoma State on this summer day to tour the Circle of Trees made possible by a donation she made after the planting ceremony. The 18 trees, planted around the picturesque pond at the University's Commencement Lawn, were picked by Sam Youney, Sonoma State's director of landscape services, from a book about trees native to the area of Foster's hometown of Cieszyn (che-schen), Poland. In Hebrew, the number 18 means "life." Maples, dogwood and magnolia are among the varieties in the Circle of Trees, but it was a tilia tree that drew Foster close. She breathed in deeply, conjuring a memory from her childhood. "I remember these," she said. "We used to make linden tea from this tree." Her eyes were closed and she said nothing more, her smile confirming she wouldn't rather be anywhere at this moment other than this orchard of memories she helped create at Sonoma State.